A demon called Ryuk (voiced by Willem Dafoe) gives high school teen, Light Turner (Nat Wolff), a deadly notebook. Ryuk explains that, if you know a person’s name (and face), you can write it down in the book and then specify how and when that person will die. Entrusted with this phenomenal power, Turner takes his revenge on the world’s bad guys - the people who make life miserable and cause pain. However, where will he draw the line? In his pursuit of ultimate justice, will Turner lose everything? First things first. I don’t have a problem with cinematic remakes, reimaginings, retellings - call them what you will. One of my favourite horror movies, John Carpenter’s The Thing, is of course a remake of Christian Nyby’s film: The Thing From Another World. I also believe in our right to choose what we want to watch. If you really don’t want to see a remake of your favourite film, just don’t watch it. (Hence why I have never seen Matthijs van Heijningen’s 2011 remake of The Thing). However, I do have a problem with the disturbing trend of whitewashing in cinema. As a lover of all film, I want to visit different places and experience different people's lives and cultures - that’s why I love world cinema. 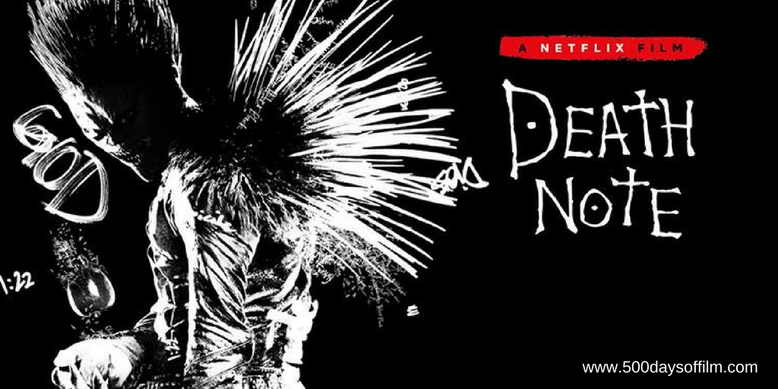 As a result, I can understand the controversy surrounding Adam Wingard’s crime horror, Death Note. This adaptation of the Japanese manga series (written by Tsugumi Ohba and illustrated by Takeshi Obata) takes the story out of Japan and onto the streets of Seattle. Now, full disclosure, I have not read Death Note and so, bearing the above caveats in mind, decided to set the controversy aside and write this review based on my experience of the film alone. Death Note is based on a fascinating and intriguing premise. What if you could rid the world of all its evil people? Would you? Could you retain your own morality with this power? Just how long would it take before you, yourself, became evil? Sadly, despite its potential, Wingard fails to translate Death Note’s interesting premise into even a halfway gripping thriller. He struggles with the pace of his storytelling - racing ahead when he should, in fact, stop and develop his story and its (sadly two-dimensional) characters. The film’s tone is also frustrating - unable to balance Light’s high school angst with his darker role as an avenging angel. In addition, Death Note features an unconvincing teen romance between Light and Margaret Qualley. What happens between them later in the film is desperately unearned and feels more than a little ludicrous. While Death Note does show occasional flashes of interest (both narratively and stylistically), it is unable to make us care about its characters or convey the compelling moral battle at the heart of its story. And that feels like a missed opportunity. Have you seen Death Note? If you have, what did you think of this Netflix film? Let me know in the comments section below or via Facebook or Twitter (@500DaysOfFilm).